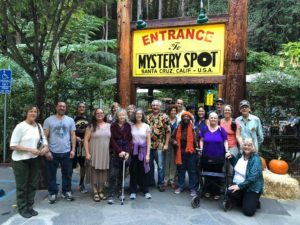 Our Santa Cruz Dowsers Group is now forming. It’s wonderful to have such a large group in our town who are dedicated dowsers and diviners. We had our first field trip together to the “Mystery Spot” last weekend. For those out of town, the Mystery Spot is described as a gravitational anomaly located in the redwood forests just outside of Santa Cruz, California. In the photo above, we are at the bottom of the hill all standing up straight, but at the top in the cabin there is a lot of leaning going on. When I was in the cabin, I realized I had visited the Mystery Spot decades ago with my father. I remember him tall, I was short, and together we were leaning in the little cabin. All of us walked up the hill to the cabin together. It’s so strange, but when you’re in the 150 foot radius of this weird energy field, your body gets very heavy and it’s hard to move. Once in the cabin, I tested to see what my pendulum would do it spun clockwise, then counterclockwise, and did this the whole time I was in the cabin.